Two of the most important economic indexes to the S&P 500 just made new all-time highs this month - the Housing and Retail indexes. Consumer spending in its many forms (i.e. housing, discretionary items and necessities) makes up the largest part of annual Gross Domestic Product (GDP) in the USA. This key sector of consumer spending equals about 30 percent of the total GDP. Growth in this area is one of the principal regions that the Fed monitors when it develops its interest rate policy. 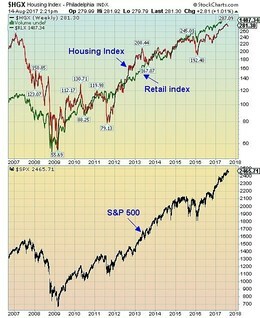 From a stock market perspective, these two indexes (housing and retail) provide an invaluable guide to the S&P 500. Since bottoming in late 2008 and early 2009, both indexes have maintained an upward trajectory and recently reaching all-time highs. And both leading indexes are showing no signs of weakness. This bodes well for the US economy going forward and for the S&P 500. Bottom line: Consumer spending is the largest segment of the US annual GDP making up about 30 percent of the total. The Housing and Retail indexes are key sub-sectors within consumer spending. Both indexes (housing and retail) have recently reached new all-time highs with no signs of weakness. This suggest to us that, with the US economy (business cycle) still expanding, additional upside is probable. And as these two key indexes parallel the S&P 500, it also implies that the upward trend of the equity index is likely not finished. Our models point to 2600 as a late Q4 target for the benchmark index.